One of the most useful productivity apps for Mac and iOS users is Parallels Access. Devised by the same developers who brought you the Parallels Desktop virtual machine environment (available from OWC), Parallels Access give you full control and access to your Macs from an iPhone or iPad. The company released Parallels Access 3.0 (free with in-app purchases) yesterday, bringing not only a lot of new features and performance boosts with it, but also adding a new Apple Watch companion app. No, you won’t be able to remotely control your Mac from your Watch, but you can check to see if the Parallels Access desktop client is running and ready for a connection, initiate the connection with a tap on your Watch, and control any media playing on the desktop. File Sharing — Share any file directly from your computer. No cloud storage required, no file size limit, no upload time wasted. Just get a link to a file on your computer and share it with your friends. 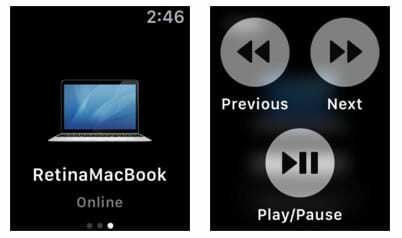 Apple Watch companion app — Now you can see your remote computer’s status, initiate a connection to it, and control media playback on remote computer, right from your wrist. Gaming mode (experimental) — Special mode with easily accessible controls for modern computer games. Note that the desktop software has also been updated. The update can be downloaded and installed from the Parallels Access menu bar icon.